Please refer to our stock # 3101 when inquiring. 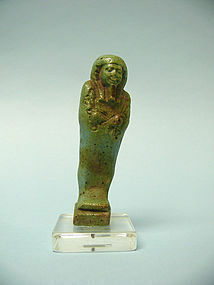 Small Egyptian Turquoise Glazed Composition Ushabti / Shabti, Late Period - Ptolemaic , ca. 400 - 30 BCE. Uninscribed and with slight tilt, perspex mounted. With seed sack on back, arms folded across chest. In excellent condition. 3 3/4" high x 1" wide x 1" deep. Perspex mount is 1 1/2 square. The ushabti (also called shabti or shawabti, with a number of variant spellings, Ancient Egyptian plural: ushabtiu) was a funerary figurine used in Ancient Egypt. Ushabtis were placed in tombs among the grave goods and were intended to act as servants or minions for the deceased, should he/she be called upon to do manual labor in the afterlife. The figurines frequently carried a hoe on their shoulder and a basket on their backs, implying they were intended to farm for the deceased. They were usually written on by the use of hieroglyphs typically found on the legs. Called “answerers,” they carried inscriptions asserting their readiness to answer the gods' summons to work. The practice of using ushabtis originated in the Old Kingdom (c. 2600 to 2100 BCE) with the use of life-sized reserve heads made from limestone, which were buried with the mummy. Most ushabtis were of minor size, and many produced in multiples. They sometimes covered the floor around a sarcophagus. Exceptional ushabtis are of larger size, or produced as a one of-a-kind master work. Due to the ushabti's commonness through all Egyptian time periods, and world museums' desire to represent ancient Egyptian art objects, the ushabti is one of the most commonly represented objects in Egyptology displays. Produced in huge numbers, ushabtis, along with scarabs, are the most numerous of all ancient Egyptian antiquities to survive.